This incredible Burgundy Wedding Dress is made with gorgeous Bridal Satin and Organza. This Wedding Dress is fully customizable. It's available in any color, with or without a train, zipper back or corset back, sleeves, higher necklines, and many more options. Simply email us with any questions. We would love to help you find your beautiful dream wedding dress in your favorite color. Can't find what you're looking for? 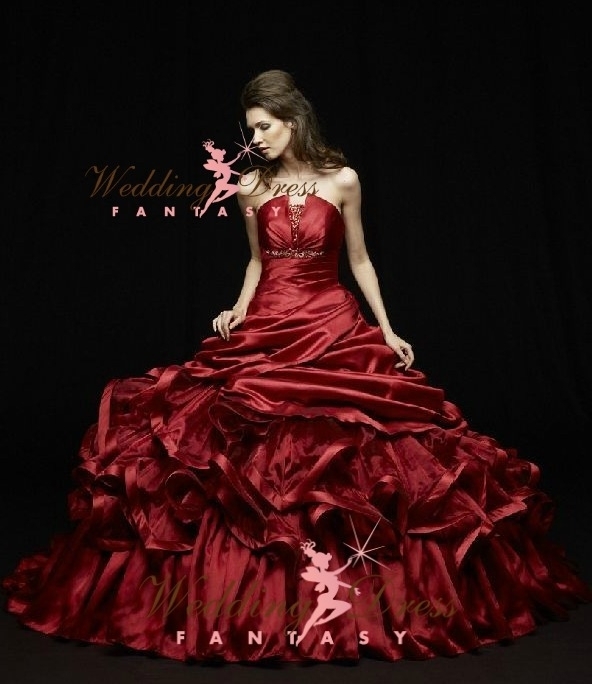 Let Wedding Dress Fantasy design a custom wedding dress with your ideas and specifications. Simply contact our Teaneck, NJ Bridal Salon at 201-357-4877 or contact@couturedebride.com. Wedding Dress Fantasy is rated 5 Stars on WeddingWire.com. We were also voted Best Bridal Salon by 201 Magazine. Wedding Dress Fantasy, dressing the world's most sensational Brides.